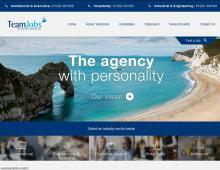 TeamJobs are a professional recruitment agency in Poole and Bournemouth. Their expert team of recruitment consultants are ideally placed to help candidates find local jobs in Dorset. If you are looking for dependable job agencies in Poole or Bournemouth, look no further, TeamJobs have an outstanding reputation and were awarded Dorset Company of the Year in 2015. Seeking receptionist jobs, customer service jobs, procurement roles, store manager jobs in Bournemouth, or retail jobs in Poole? Then browse the current Bournemouth jobs and Poole jobs on offer in the Commercial sector using the online search facility. Engineering jobs and IT jobs can only be filled with highly qualified and experienced candidates. TeamJobs have a wealth of experience in finding exceptional candidates to suit specific engineering jobs in Bournemouth, IT jobs in Poole & similar jobs in Christchurch Dorset, jobs in Dorchester, jobs in Weymouth and throughout the county of Dorset. Highly experienced executive recruiters will work with your business to head hunt senior and board level candidates, the team can also help with solutions for high level human resources jobs, marketing jobs and sales jobs. TeamJobs recruit for lots of industrial companies such as automotive and electronic manufacturers, typical jobs Bournemouth companies recruit for range from packing and warehouse jobs to assembly workers and warehouse manager jobs in Dorset. Looking for Jobs In Dorset? Are you short of employees? Searching for recruitment agencies to fulfil your staffing needs? Contact TeamJobs to provide expert recruitment solutions, work with one of the most successful recruitment agencies in Bournemouth & Poole.